2015 was a good year for the solar industry in Wisconsin. Renewable energy, and the movement to make it more widespread, was partially pioneered in Central Wisconsin in the 1960s and 1970s. And from those first forays into that new technology the Midwest Renewable Energy Association – or MREA - was born. This weekend the organization is staging its 27th annual Energy Fair – a tradition that attracts thousands of people from around the country. Ahead of the fair’s kickoff today, we talked with three Milwaukee-based renewable energy proponents. Peter Murphy is MREA solar program manager, Elizabeth Hittman is sustainability program coordinator with the Milwaukee’s Environmental Collaboration Office. They’re currently working with homeowners interested in installing solar through a group buy program. "People come with this high number of their head of what it's going to cost them to go solar. (But) the price has come down so much in the last decade on the actual components, so they're always pleasantly surprised," Hittman says. She says additional savings come through a Focus on Energy $600 per kilowatt installed cash back, a federal tax credit and net metering. "So those three things. And net metering is when you have that second meter on your home. One meter keeps track of how much energy you're using, and the other keeps track of how much energy your solar panels are producing. If you have excess production at the end of the month, you would get credit from the utility," Hittman says. Amy Heart is senior manager of public policy for California-based Sunrun and part of the Alliance for Solar Choice. Heart says the federal tax credit was recently extended with a gradual phase out plan. As for Focus on Energy, she calls it a stop-start incentive in recent years. "Where the beginning of year we'll have an incentive. The second half of the year we won't because they ran out of funding and so creating a stable program mirroring that investment tax credit at the federal level would be help the industry get their legs under it and then it phases out and that creates predictability," Heart says. She says other states are embracing renewable energy more wholeheartedly that Wisconsin does. "States have strong policies supporting anything from rooftop solar to large wind farms," Heart says. She says that's the trend on both the east and west coast. "And a lot of that is spurred by high energy prices, but it's also a commitment to what we want in the state, we don't want to be shipping in coal and we want to create a resilient grid in the future. It's the regulatory environment but also the policymakers saying this is what we want to support," Heart says. Heart says wind energy is getting a boost thanks to a utility-scale project in southwest Wisconsin, however, it's the state's first large-scale turbine project since 2011. Heart says consumers are getting more involved in the energy conversation. In 2014 a record number of people spoke out at Public Service Commission hearings in Milwaukee. "There was a proposed rate increase for We Energies. 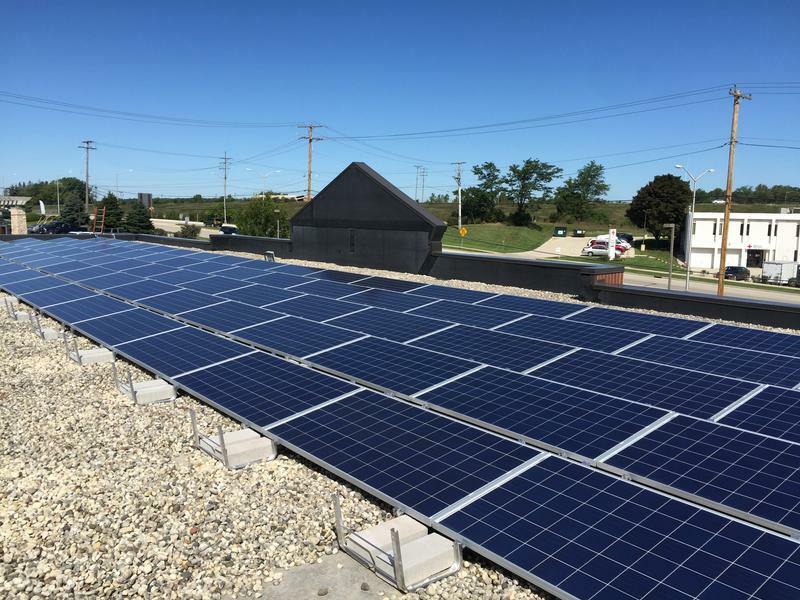 The fixed increase did go up but in addition to that, We Energies had proposed an additional fees for customers who had solar on their rooftops," Heart adds, " and so we saw record-numbers of people going to public hearings." 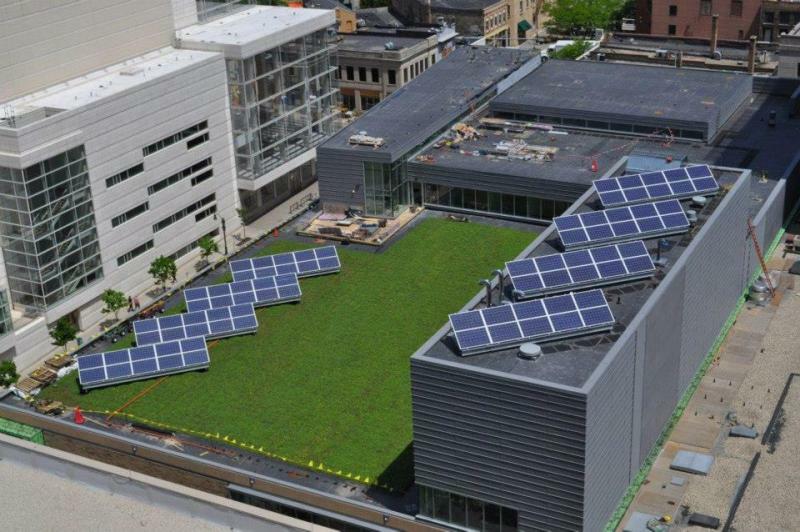 We Energies' solar fee request was ultimately denied. Peter Murphy with MREA observes people are becoming much more connected to the energy conversation, especially when it comes to solar. He points to the recent arrive of Google's Project Sunroof in Milwaukee. "It's really easy to see if your home is even suitable for solar......You can type in you address and see your solar opportunity but also that of all your neighbors," Muphy says. 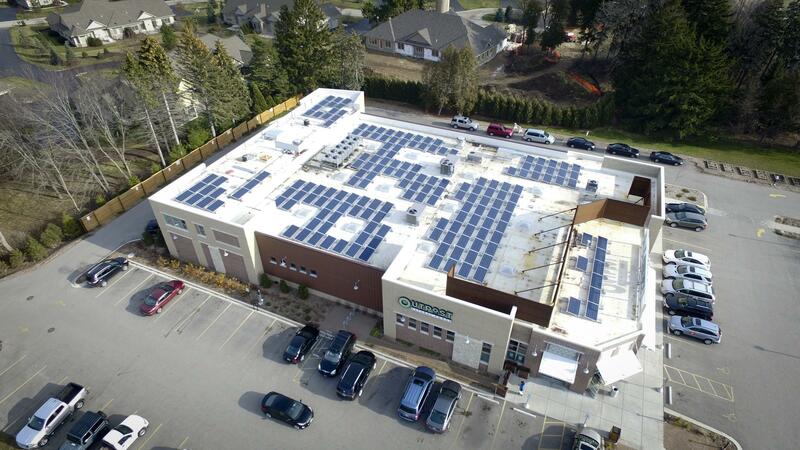 Pewaukee-based builder and developer Matt Neumann added solar installation to his business in 2009. He calls the timing perfect. “Because in 2008 the federal investment tax credit was extended until the cap was lifted so you could receive a 30 percent tax credit for any system you install, whether is was $1,000 or $ 1 million,” he says. WUWM environmental reporter Susan Bence interviews renewable energy experts Karl Rábago and Dan Arvizu. A former U.S. Energy Department leader says Wisconsin's efforts to implement and grow sustainable energy resources show signs of "stalling" and even "going backward." WUWM environmental reporter Susan Bence interviews founders and current members of the Midwest Renewable Energy Association. We travel to central Wisconsin to learn about the history of the Midwest Renewable Energy Fair.